The moment’s depth is greater than that of the future. Oudist Anouar Brahem brings his passion for past and future together in the present recording with reedist John Surman and bassist Dave Holland. Although he has singlehandedly revived the oud as a solo instrument, collaboration has always been at the heart of his craft, whether between himself and the spirit that moves him or with the muses of others. Most of the material on Thimar is Brahem’s and its lack of chording and bar lines in the scores presented Holland and Surman with new and fruitful challenges. One would hardly know it from the fluidity of the session. The album’s title means “fruits” in Arabic and, like those on a tree, the tunes it designates aren’t so much blended as connected by bark, water, and minerals. The press release cites recent musicological research which suggests that jazz may have its roots in the Middle East, for the West African musical traditions it mined were already syntheses of Islamic influences. This is not a “fusion” project. It is an illumination of roots. 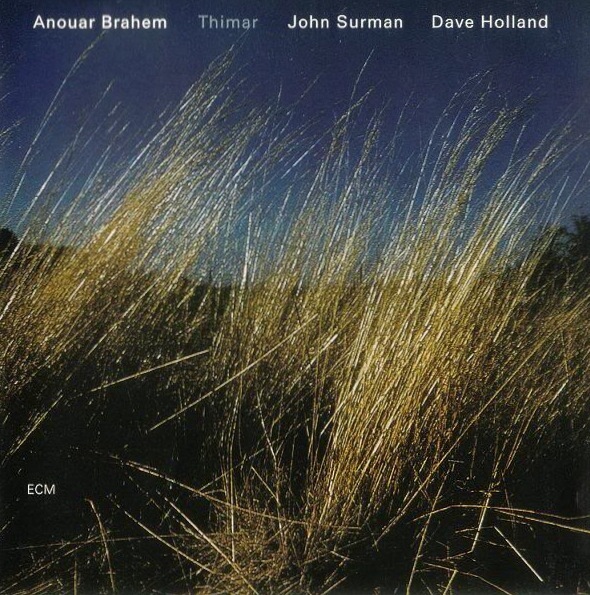 Brahem also brings a love of Surman and Holland’s work, introduced to him by way of producer Manfred Eicher, notably through Road To Saint Ives and Angel Song. We might not be wrong, then, in shelving Thimar alongside those ECM gems. The latter of the two is especially ripe for comparison, as it likewise pushes jazz envelopes in an intimate, percussion-less setting. Only here, the added element of Brahem’s keen restraint breeds an enchantment of a different order. Despite his centrality in the program that unfolds, it is some time before he enters the stage. Instead, “Badhra” opens with an adaptive, harmonium-like drone from Holland and Surman’s buttery soprano wafting in the breeze. Holland melts into a solo that rises from the earth, soil made flesh. One might say he treats his bass like an oud, so that when Brahem appears at last it feels like a natural extension—youth to ancestor—and renders Surman’s intonation all the more calligraphic for its contours. Surman is formidable in this setting, not by means of technical flourish but more so by the movement of his playing. He scribbles masterfully in “Mazad,” bringing an ever-deepening sense of destination to perhaps the most recognizable soprano in recorded sound. That singing reed has hardly sounded better. He further provides a lone interlude in “Waqt,” and one original, “Kernow” (Old English for “Cornwall”), in which his bass clarinet shadowdances with oud. Holland’s contributions are equally profound. His walking lines in “Kashf” inspire a unified sermon from the trio and plunk like amplified raindrops from leaf to leaf in “Houdouth.” He is an accommodating and adaptable soul, especially in “Talwin,” where his drum-like sensibilities bring rhythmic drive (as they did in Angel Song) to the exchanges swirling around him. For all the highs and lows, Brahem remains the ultimate truth of these proceedings, our guide on a journey he defines as he goes along. The heart-to-heart tunefulness of “Uns” pins the album’s ethos on its sleeve, evoking villages and bustling metropolises alike. In “Qurb” he adds metallic taste to Holland’s protracted Brew and sings into the tunnel. His “Al Hizam Al Dhahbi,” with its fluid doublings and harmonies, is the session’s crown, a memory in the making. There is a locomotive circuitry in his writing that runs all the way through “Hulmu Rabia” (Rabia’s Dream), signing off elegiacally with a nod to the first female mystic of Islam. Thimar holds a coveted place in my listening life, for it was my first time hearing each of its three musicians. Separately, they are powerhouses of influence in their respective fields. Together, they are like the cover photograph: Holland the silhouetted land against Surman’s gradated sky, and Brahem the strings hatching their meeting at dusk. Brahem AND Surman AND Holland…….together. WOW.